← Toyin Aimakhu Johnson Goes Highly Comical In A Silent Cry : September 5th! 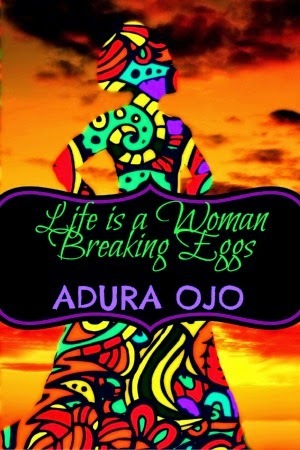 Life Is A Woman Breaking Eggs By Adura Ojo: Outstanding! Fantastic!, Ingenuity laden writer Adura Ojo is out with ‘Life is a Woman Breaking Eggs’; her debut poetry collection. Life is a woman breaking eggs.. hmm the title is really deep… relays the unflinching account of a woman’s footprints on a path she makes her own. Spheres of existence provide insight into a humanity challenged, shaped and strengthened by elements of identity and survival. Adura Ojo is a British-Nigerian author, poet, blogger and a mother of two. She loves observing the world around her and teasing the voices within. Her work has been recognized and praised on many fronts. Life is a woman breaking eggs is available on amazon.com. This entry was posted in Uncategorized and tagged adura ojo, life is a woman breaking eggs by adura ojo, poetry book titled life is a woman breaking eggs. Bookmark the permalink.